P188104LF-SD is rated 2.1 out of 5 by 27. Pull-down wand operates in an aerated or spray mode via swivel spray face. Rated 2 out of 5 by Jessica from Broke! 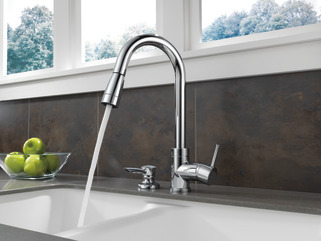 We purchased this in 2013, and though we like the high arc and other features, the twisting from stream to spray had become increasingly difficult until it recently broke the head of the faucet totally, spraying water everywhere! I now get why most faucets use a button. Good product for awhile, just wish it was designed better! Rated 4 out of 5 by Donk from wand not switching from stream, to spray. 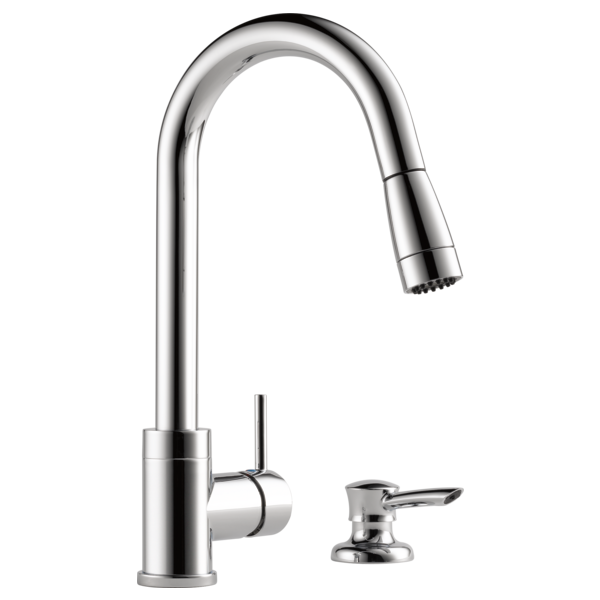 We have had the faucet model P188104LF-SSSD for several years, It has been a good faucet for us. I never liked the way you have to switch from spray, to stream, but learned to live with it. (you had to stop it in a certain spot to get stream) NOW the wand will not fully switch to stream. The wand needs replaced. I think if this wand was a button type switch, instead of twist you wouldn't be having these problems. Rated 2 out of 5 by Chas73 from Update:Great faucet until cheap sprayer head broke Update: Peerless graciously came through and sent me a new sprayer head so kudos on their customer service, as befits, and one would expect from, a brand like Peerless. Unfortunately, the sprayer looks just like the original and has the same part number so I expect that this one will break in a few years, too, so I still cannot recommend this particular faucet, although I would look at other Peerless faucets in the future. Every company sometimes releases a clunker product; it's how a company stands behind that product to make it right that defines a good company. Peerless is trying to do the right thing with this product. Rated 2 out of 5 by Chas72 from Great faucet until cheap sprayer head broke Like most of the other reviewers, perfect faucet until the sprayer first lost the indents for switching from stream to spray, then the whole bottom part of the sprayer fell out. Considering the number of reviews with the same problem, it's obviously a design flaw - definitely not the quality that I attach to the Peerless name. Is Peerless replacing these defective sprayers, hopefully with a new design? Rated 2 out of 5 by Rental Guy from Broken Plastic Spray Wand----SAME PROBLEM I would normally buy one of the more economical faucets sold by Home Depot for a rental property I own, knowing renters can be rough on fixtures and resigning myself to having to just toss the unit out after a couple of years. This time my wife suggested we go to a top of the line unit since we had a great renter and the MOEN unit in place was acting up on her. We narrowed it down to a Kohler unit and the Peerless unit, which I ended up buying against my wifes suggestion...which I have been reminded about since learning from the renter that the spray wand head broke off in her hand. She felt terrible thinking it was her fault until I emailed he a link to your comments page and the same exact problem was documented over and over. Sad to see your name doesnt live up to the product...In fact the low cost MOEN outlasted the Peerless unit by a wide margin. Having said that, the design and operation of the water temp valve was good...and Credit is due that you posted up real comments highlighting the issue. Rated 2 out of 5 by JonathanS from Worked Great, then the wand broke right off We've been using this faucet for 4 years and it has been great. Then one day the spray wand just broke right off where it twists to switch between spray and stream. Now the water sprays out of control. Cheap plastic parts inside. Rated 2 out of 5 by Momma J 0410 from Great for the first year only I bought this and installed Nov 2015. I liked it for the weight of the faucet. After only a year the sprayer didn't have the stopper for selection. I dealt with that. Then after less than two years after install it started leaking there and changing the sprayer selection made it worse. Then a year later, so three years after install, the base loosened and the whole handle and base twist awkwardly. Tightened underneath as much as possible and it still isn't right. Of course 3 years later I can't find the receipt. Rated 1 out of 5 by Mom2Six from Same issue everyone else had... Bought this within the last 2 years, love the pull out sprayer but today had the same issue everyone is complaining about. For what we paid, definitely not happy! Is there an adapter available to accommodate a Portable Dishwasher? I have a portable dishwasher that hooks up to my old Moen faucet. I would like to buy the above faucet for my new counter and sink. By removing the spray head it could accommodate my dishwasher if I had a part that would fit in it's place or an adapter for the part I currently use. From what I saw in the store, it would need pipe threads to fit the new faucet and machine threads to attach to the old fitting. Having done so myself, I can say that there are not backpressure issues as suggested by the manufacturer. It is a 1/2&quot; pipe thread. To convert that to a facet thread, you will have to go from the 1/2&quot; to 3/4&quot;GHT (Garden Hose). From there (1/2&quot; Male to 3/4&quot; GHT Female) I was able to go 3/4&quot; GHT Male to 55/64&quot; Female Inside 15/16&quot; Male Outside, then using a 55/64&quot; Male-Male Coupler to my 55/64&quot; Female Inside 15/16&quot; Male Outside Quick Attach Snap On Aerator that attaches to my portable dishwasher. You will want to screw it all together using wrenches and pliers to avoid drips. I have found that the Quick Attach adapter for my portable can come off the end and be put back on by hand easily so I can swap in my water filter whenever I want and that finger tight is enough to not get drips between that and the coupler. can i turn it around so the handle is on the left? Is it possible to change the stream/spray option so the default is spray? Loving my new Peerless faucet so far, particularly the ability to switch - with the press of a button - the faucet head to a shower-type spray rather than the default single stream. Thing is, the spray is more convenient for almost all uses. Is it possible to change the default to spray? How do you tighten the swivel neck? The neck that the pull down head seats in rocks back and forth in the base. Is there any way to tighten it. Can I get another matching soap dispenser with this faucet? Can I buy it separately? Does this faucet have flexible supply lines or copper lines? Is there any plastic in the faucet assy, other than the flexible connections? Is there plastic in the soap pumper?